In the not-so-distant past, people of various business profiles in need of a quick, edgy, nimble, and versatile vehicles had quite a limited choice. Cargo vans came only in proper, as-big-as-it-gets sizes, with limited fuel economy, and set, market-induced prices, not suitable for everyone’s pocket. Among them, the big, full-size, the daddy Ford E Series was highly coveted, renowned for its great towing capacity, payload size, and range of motor options and trim. However, not everybody was up for that kind of size, at the expense of it not being the most fuel efficient cargo van on the market. Not that we mean to say anything bad about it, or other big brother cargo vans still out there, still dominating the hauling and transport niche. No, far from it. The thing is, some business owners don’t need all that space and power. They need a smaller, cheaper, and more efficient vehicle that is still able to pack enough punch for all their business needs. Enter the small cargo van. A relatively new entry to the existing range of the cargo spectrum, it has found its spot among the giants of the trade. It offers most of the versatility, size, and power of its bigger counterparts, while being cheaper to run and cheaper to buy in the first place. And, since the market still craves these feisty little cargo rascals, there are more and more models surfacing constantly. Making the matter of buying one all the more difficult. Yes, you want to have a choice, naturally, but they’re all seemingly quite similar, aren’t they? Well, not really. Although roughly similar in size and shape, differences lurk within, waiting to be uncovered. Which is why we have decide to help you out a bit. Finding the best small cargo van is not a task easily tackled these days, but we are here to ease the stress as much as we can. Take an in-depth look at our top picks. Going for any one of these would not prove a mistake, but let’s try to help you find the best compact cargo van for you. We will take a look at the most important categories for each one – the size, cargo capacity, payload capacity, fuel efficiency, range of motors, and, of course, the price. Read on and take your first step towards becoming a proud owner of one of the best small cargo vans on the market. We start with the newcomer among the newcomers, the Japanese addition to our American-made saturated list, the smallest of the lot, the contender, the underdog, the unlikely candidate – Nissan NV200. 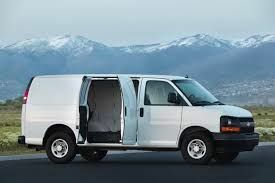 As we all know, the small cargo van territory is not a market where you commonly see many vehicles that haven’t been made either in the US or Europe. Their market position has been well cemented over the years, making it rather difficult for new entries to make their way on it, let alone near the top. The size – The Nissan is by far the smallest in the small cargo van category. So, if you need a truly mini cargo van, this might be the choice for you. If you don’t plan on hauling excessively bulky cargo, then you can consider the Nissan despite its size. But, what it lacks in size, it makes up in nimbleness, boasting a 36.7 feet turning radius. Not bad. Cargo capacity – As we’ve already said, it is the smallest on the list, with the cargo capacity of just 122.7 cubic feet. We say just, but, if you think about, it’s not that bad. On the other hand, it does have a 53-inch cargo height, which means you can freight taller cargo without a hitch. Range of motors – Not very much to discuss in this department. You get a two liter engine with four cylinders and 131 horsepower, which, even in family cars, can be too little at times. It produces 139 pound-feet of torque, which is also on the low end. The upside is the CVT automatic type of transmission, minimizing the hassle of navigating narrow, city streets. Payload capacity – As a consequence of its lack of power, the payload capacity for this model is not that great either. You only get 1,480 pounds, which means that it can quickly get overloaded if you decide to cram it to the brim. Fuel economy – There is one major upside to the underwhelming power and the small size of the Nissan, and that’s fuel economy. It has the best overall fuel economy in its class, ranging from 24 MPG on city streets, to 26 MPG on the open road. Not bad at all if we can say so ourselves, making it the best small cargo van in this aspect. The price – When it comes to the matter of how many green ones you need to set aside for this one, Nissan has intelligently placed this small cargo van to the very bottom. It is the cheapest small cargo van on our list as well, with prices starting at only $21,900. So, if you want it cheap, Nissan is the way to go. The verdict – As a great hauler of much cargo, the Nissan NV200 wouldn’t be our pick, and it certainly shouldn’t be yours. However, taking into consideration the price, the fuel efficiency, and the fact that it is quite sharp and flexible on the steering, it will find its way to the target audience. People who need to haul relatively light cargo quickly and cheaply will certainly take this cute underdog into consideration. The baby brother to the legend, this small cargo van has some big shoes to fill. Ford Transit is widely regarded as the most important vehicle ever to grace the cargo van field, and it has been the choice of many a business owner for all their hauling needs. Now, the Ford Transit Connect has to show what it’s made of, and try to live up to the stellar reputation of the full-size Transit. And it started off on the right foot. In 2010, it single-handedly kick-started the whole small cargo van trend, which lives strong to this day. Just as the bigger and older Transit, the Transit connect was the pioneer. Now, eight years later, it’s still as important on the compact cargo van market as it used to be. Let’s see what’s what. The size – Second smallest on our list, the Transit Connect offers more space that the Nissan, but, for some people, it might prove to be a tad tight for space. However, as a consequence, the turning radius remains solid at 40 feet, which is enough to circle about the city streets. Cargo capacity – Ford know they have a big cargo van winner, so they’ve wisely made the smaller Transit Connect just that – smaller. It has a 128.6 cubic feet of cargo space, and a great interior height of 49.7 inches. As a big hauler, it’s still a small cargo van, but with plenty of space and overhead room to be used intelligently. Range of motors – Unlike the Nissan, Ford offer you a choice when it comes to motors. There’s the 2.5 liter with 169 horsepower, alongside 171 pound-feet of proper torque, as well as the 1.6 liter four cylinder EcoBoost with 178 horsepower and even more torque – 184 pound-feet of it. Both options are light on their feet, offering plenty of power and an automatic six-speed gearbox. Just make sure to buy premium fuel for the more modern EcoBoost motor. Payload capacity – The 1,620 pound payload capacity is a significant increase when compared to that of the Nissan. That being said, it can still prove to be insufficient for the more enthusiastic of business owners looking for best small cargo van. However, it is big enough in this class. You do have to consider the 180 degree doors that make for easy loading though. Fuel economy – The combined stated fuel economy is 23 MPG, with a projected drop to 20 MPG in the city. However, the 29 MPG open-road estimate for the EcoBoost model is a significant tick in the Connect’s column. Overall, the fuel efficiency seems good for the motors offered. The price – Starting at $23,215, the Ford is rather well priced, especially taking into account the prices of the Ram, which we’re going to review next, and the Mercedes. It is more expensive than the Nissan, but, in our opinion, offers a lot for the price difference. The verdict – We are glad to report that the legacy of the original Transit is well kept by the Transit Connect. Yes, it’s not the biggest, but it is well-priced, quite economical, great to look at with those wide and airy side windows, and it does have some interesting choices when it comes to available motors. You couldn’t go wrong with Ford once, and you still can’t go wrong with it today! It’s definitely at the very top of the small cargo van market. The American thoroughbred in the small cargo van category, the Ram is here to battle it out with the legends and pretenders alike. Ram is a manufacturer mostly associated with big, powerful pickup trucks, and company execs are looking to translate that raw, raunchy reputation into the small cargo van territory. So, let’s see how they’ve managed here. The size – Certainly bigger than both the Ford and the Nissan, the Ram surpasses its direct combatants in every size-related aspect. The beginning is good then, the Ram looks to strongly overtake the competitors in one of the most important areas of the small cargo van battle. Cargo capacity – With bigger size comes more interior space as well. The Ram doesn’t only make for an imposing figure on the outside, but on the inside as well. The 131.7 cubic feet cargo area is a lot to be trifled with, and the overhead height of 51.8 inches is astounding as well. The 180 degree cargo doors are just another perk. The Ram carries on strongly! Range of motors – The ProMaster City palette of motors consists of a single, 2.4 liter engine with four cylinders, providing 178 horsepower at the push of the gas pedal, with 174 torques. On par with the Transit Contact, a lot better than the NV200. It’s front-wheel drive, same as the Ford, and it has a nine-speed auto. Again, very, very good. Payload capacity – The payload capacity is also greater than that of the Ford or the Nissan. With 1,886 pound maximum, it is able to haul even the toughest and tallest of cargo. It will be rather difficult to over load it. It’s difficult to find a fault with the American. Fuel economy – As you may have guessed, the fuel economy is also alright. 21 MPG city, 28 MPG open-road fuel efficiency. Pretty similar to the Ford, worse when compared with the Nissan. That is expected with the more powerful van engine. It looks like ProMaster is turning out to be an excellent all-rounder. The price – The starting price for this bad boy is $23,995, right up there in the Ford’s range, although a less more expensive to begin with. It seems that the Ram is well-prices in this category, and that customers are going to have a tough time deciding between it and the Transit Contact. Or are they? The verdict – Unfortunately, we have to mention some of the drawbacks of buying the Ram as your small cargo van of choice. Not everything’s coming up roses. The safety features are lacking, with only the commonplace rear parking sensors and rearview camera making an appearance. As a driving machine, it still falls short of the mark set primarily by Ford Transit Connect, but also by the Nissan. The turning radius is 42 feet, it’s longer than both the NV200 and the Connect, and it is not quite suitable for the tights spaces of everyday city driving. It’s a great option for city-to-city hauls, but it shouldn’t be your first option for inner-city tasks. Oh you Mercedes. You’ve spoiled us with your S-class, you’ve brought luxury family vehicles to the masses with the affordable C-class, and now they want a slice of the small cargo van cake. Mercedes-Benz is one of the most, if not the most sophisticated car manufacturer on the planet. You would be hard-pressed finding a fault with any of the vehicles from their wide range. The same philosophy holds true for the Metris as well. Let’s first see what exactly it is the Mercedes has to offer. The size – It’s the biggest of the lot, plain and simple. Even its short-wheel base doesn’t stand in the way of the desire to be the big daddy of the small cargo van world. It is the biggest, the most imposing, and it’s also the looker of the group. Cargo capacity – Don’t be surprised when we tell you that the Metris also boasts the largest cargo capacity of all the best small cargo vans we have selected. The 186 cubic feet of indoor cargo space, coupled with the interior height of a whopping 55 inches, make the Mercedes stand out above the direct competition. And, they’re not done. The rear cargo doors offer three possible configurations, for up to 270 degrees! Range of motors – The two liter, four-cylinder, turbocharged best of an engine produces a mind-boggling, head-spinning, 208 horsepower, and another 258 pound-feet of torque. Yes, we agree – wow! The Metris leaves all the competition in its dust. Payload capacity – Again, the Metris takes the medal. It is the class leader in payload capacity with its 2,502 pounds of it. That’s a lot, even for a full-sized van. The people looking to buy this model know exactly what to expect, and great payload only comes as an additional boon on top of everything else. Fuel economy – All right, not everything is perfect when it comes to the Metris, but taking into account the raw power at your fingertips, or, better said, at your toe tips, it would be asking too much for the Mercedes to be the leader in fuel efficiency. Although, the 21 MPG when in the city, and the 24 MPG on the highway is not that bad. Frankly, we were expecting it to be a bigger gas guzzler. The price – Let’s pull the band aid off quickly and tell you right away – the Metris is the most expensive small cargo van. The prices start at $26,000 for the simpler, Metris Worker variant, and you would have to spend $29,000 or more if you would like to buy the Metris Cargo Van. Speed, space, quality, and prestige always come at a price. The verdict – We’re not going to tilly tally, the Mercedes-Benz is the most sophisticated, powerful, prestigious, and the best looking small cargo van money can buy. The small drawbacks of slightly poor fuel economy, price, and larger size are worth taking into consideration, but we feel you would have great difficulties finding a better small cargo van currently in production. The Mercedes has it all, and it’s happy to flaunt it. So it should! Which One is the Right Small Cargo Van for me? This is the question only you can answer, as we feel that all four of these mini cargo vans are going to reach their target audience easily enough. If you want a small, compact cargo van, ready to tackle minor hauls, while being cheap to run, cheap to insure, and easy to maneuver, then your choice would have to be the Nissan NV200. If, on the other hand, you would like a large, mean, spacious and capable big hauler, with attitude to spare, the Ram ProMaster city should be your only option. The Ford Transit Connect is going to be a top-seller, we have to doubt about that. It is positioned right in the middle in all aspects – power, size, economy, and price. It is the best reasonably-priced all-rounder of the bunch, and it’s only an added benefit that it’s great to look at. Finally, if you plan on sparing no expenses, if you don’t mind the price, the low fuel economy, and the big size, but you want to pay top dollar for the best small cargo van currently on the market, then we heartily recommend the Mercedes-Benz Metris. It looks amazing, it has tons of power, it can haul whatever you want it to, it can tackle any task, and it carries the all-to coveted badge. Just be careful when parking, it’s bigger than it looks. Looking for the best small cargo van? You’ve come to the right place! Fleetworks of Houston is the go-to company for everybody looking for the best cargo vans the market has to offer. We are a premium business, highly focused on making every one of our customers happy with their purchase. We have a wide selection pre-owned vehicles, all in the best possible condition, so we are confident that you will find what you’re looking. Contact us today, we would be happy to show you around!